Patients often focus on short-term goals such as getting through treatment or going into remission for a year. Writing about these tangible goals can help them cope with treatment better. Just as anyone who sets a goal is more likely to achieve it, patients who set goals for their treatment have a better prognosis than those who do not. Patients can approach these short-term goals in a variety of ways. Writing down their goals and hanging them up where they can see them helps remind them of what they are trying to achieve and keeps them focused on recovery. Some patients also find it helpful to keep a journal about their treatment. Journaling is an effective way to release negative feelings about disease so that patients can remain in the positive state of mind necessary for cancer recovery. It’s important for patients to avoid focusing exclusively on their disease and its treatment. Before getting ill, most people had hobbies and things they looked forward to, and it can sometimes be difficult to focus on these things after a diagnosis. However, enjoying life as much as possible for as long as they can after diagnosis can help patients recover better. In addition, individuals should make as many good memories as possible—-positivity is uplifting and guides healing. Thus, patients should add some daily goals to their treatment goals. For example, some patients may set a goal of reading a certain amount of pages in a book. Writing down these goals can help patients remember the things they enjoy and give them things to look forward to, both of which can help improve their chances of recovering from cancer. We had many scrumptious choices this month – too many – hard to choose just one. 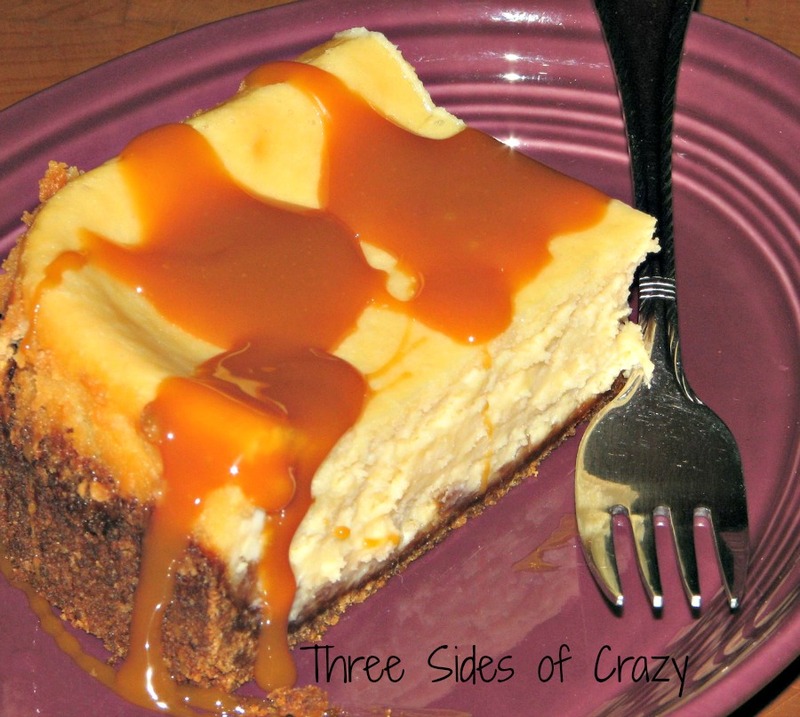 It was a beautiful and classic cheesecake, tangy and sweet, with a velvety smooth and rich texture.I added my homemade caramel sauce and served it for Easter. Place a 9 inch spring form pan on a large sheet of heavy duty foil. Smooth foil up the sides rolling at the top edge. You are basically making your pan water proof. Grind the graham crackers and/or ginger snaps in a food processor until finely ground. In a large bowl stir together the crackers, sugar and salt. With your hands blend in the melted butter until you have a uniform consistency. Press the cracker crumb mixture evenly into the bottom of your prepared springform pan. Cream the cream cheese until smooth. Add the sugar and beat for a few minutes more. Add the salt and vanilla, beating until well blended after each addition. Add the eggs, one at a time, beating until well blended after each addition. Add the sour cream, beating until well blended. Add the heavy cream, beating until well blended. Scrape down the sides of the mixer bowl scraping up any thicker bits of cream cheese that has stuck to the sides or bottom. Place the foil-wrapped springform pan in a large, high-sided roasting pan. Pour about 2 quarts of boiling water around the pan. Pour the prepared cream cheese filling into the springform pan over the cracker crust. Bake on the lower rack of your oven. Carefully pour the hot water into the roasting pan creating a water bath for the cheesecake. Pour enough water to reach halfway up the side of the springform pan. Crack open the oven door 1-inch or so, and let the cake cool in the oven for 1 hour. Slow cooling this way helps prevent cracking in the cheesecake. Remove the cake from the oven and discard the foil. With a fresh piece of foil, tent the cheesecake so that the foil doesn’t actually touch the cheesecake. Chill in the refrigerator for a minimum of 6 hours or overnight. In a large mixing bowl cream together the sour cream, powdered sugar and vanilla, until well blended. Chill topping mixture until you are ready to serve the cake. Run a table knife around the inside edge of the spring form pan to release anything that might have stuck during baking. Spread the sour cream topping evenly on cheesecake. Drizzle with caramel sauce and serve. Combine the cream and butter in a small saucepan and bring to a simmer, stirring frequently to prevent scorching. In a medium saucepan cook the corn syrup over a medium heat until bubbly. Fold in 1/4 cup of the sugar and continue to cook until the edges begin to turn a light amber color. Add in 1/4 cup sugar more and repeat until all the sugar is blended in. Continue cooking until amber color darkens stirring constantly. Remove from the heat and carefully fold in the cream mixture. Cook over medium heat stirring frequently until caramel is bubbling. Makes 1 1/2 cups. Refrigerate for up to 2 weeks. NOTE: Microwave20-30 seconds to soften refrigerated caramel before serving. Pommes maxim plate beautifully. Add a sprig of rosemary to the middle of each spiral, serve with a dollop of sour cream on top, or just eat them hot right out of the oven. Heat oven to 300 degrees. Place butter in a saucepan over low heat. As the butter melts, skim the foam from the surface and discard. Slowly pour off the clear, golden, melted butter into a bowl, discarding any milky residue. Toss the potato slices in a bowl with the clarified butter. Arrange the slices, overlapping, on a baking sheet and sprinkle with salt. Keller recommends using a nonstick baking sheet, but I don’t own one and was still able to easily remove the pommes maxim from the pan with a metal spatula. Bake the potatoes 45 to 50 minutes or until crisp and golden. They can be set aside at room temperature for 1-2 hours until you are ready to serve. To reheat, place them in a 325-degree oven for 10 minutes or until warm. Makes approximately six servings, although this number may vary depending on how large your potatoes are and how many slices you use per circle. In a small saucepan melt thebutter over low heat. Stir in cocoa and sugar. Add the sweetened condensed milk, chocolate chips and eggs. Stir until smooth. Remove from heat. Pour into crust. Just before serving, prepare and spread CAPPUCCINO CREME over top. Garnish with chocolate pieces, if desired. In a mixing bowl, combine whipping cream, powdered espresso, Cocoa and powdered sugar. Beat until stiff. Makes about 2 cups. For a less sweet version of this dip, reduce the cooking time for the onions. I also suggest making a big batch of the caramelized onions ahead of time and freeze them. That way, you’ll be prepared to make dip immediately whenever the urge strikes! (Just thaw the onions and follow start at step 2.). For a vegetarian-friendly dip, look for Worcestershire that doesn’t contain anchovy. Add the oil and butter to a small sauté pan set over medium heat. Once melted, add the onion, shallot, and a pinch of salt. Cook, stirring occasionally, until soft and golden brown – about 15 minutes. Add the stock. Cook another 15 minutes, or until the onions are deeply browned and all of the liquid has cooked off. Remove from heat and let cool. Add the sour cream to a medium mixing bowl. Stir in the caramel used onions, Worcestershire sauce, and green onions. Season to taste with garlic powder, salt, and pepper. Chill until ready to serve. · Pre-heat oven to 350 degrees. · Spray 9 inch stoneware round with PURE. · Toss together the krab, onions, red peppers and artichoke hearts. · Stir soup mix into sour cream and mayonnaise. Stir in cheese and hot sauce into soup mixture. · Fold krab mixture into soup mixture. · Bake 30 minutes until top is just golden. · Serve hot or cold. I serve it with wheat thins. **Mrs. Grass works well too. Even though this is triple layered there are only two components to make because the crust ‘dough’ is split in half and serves as the topping too. The bars go in the oven three times: first to cook the crust then to cook the crust with the filling then one last time with the crumbs on top to bring it all together. Three times a charm. At first glance, this recipe didn’t look very promising. My expectations were low. When I’m wrong I admit it. I was wrong. I’m excited now over the possibilities and can’t wait to make them with cranberries, cherries or figs for a seasonal treat… and wonder how chocolate chips would work out. Reasons enough to make them and eat them again and again because. . . I heart sour cream raisin oatmeal bars! These unassuming bars become unforgettable after only one or two bites. Just long enough to reel you in hook, line and sinker. Resistance is futile. This old-fashioned favorite starts with an oatmeal crust followed by a cooked sour cream and raisin filling that ends with buttery crumbs gracing the top. Three-layers of irresistible decadence. Put the raisins in a small bowl and cover them with the rum. Pre-heat oven to 350° F. Spray a 9 x 13 baking dish with non-stick spray and line with parchment paper. In a medium mixing bowl whisk together the oats, flour, brown sugar, and baking soda. Blend the butter in with a pastry blender or fork until small crumbles form. Measure out 1 + 1/2 cups of the topping into small bowl and refrigerate. Pat the rest of the topping evenly over the bottom of the prepared baking dish and bake for 15 minutes. Meanwhile in a sauce pan over medium heat combine yolks, sugar, cornstarch, and sour cream. Cook over medium heat about 15-20 minutes until slightly thickened, the mixture should simmer slowly, if needed turn heat down. Some of the mixture may stick to the bottom of the pan – don’t scrape it up. Remove from heat. Drain the raisins and stir them into the sour cream mixture. Pour the raisin mixture over the baked crust and bake for another 15 minutes until the edges are set but the middle is still very jiggly. Crumble the remaining oatmeal mixture evenly over top of the bars and bake for another 15 minutes. The bars may still wobble a bit in the middle but will set up when cooled. Allow to cool completely then refrigerate until well chilled. Remove bars using parchment to a cutting board and slice into squares or triangles with a chef’s knife wiped clean after each cut. Store in refrigerator up to 1 week. Bring the butter to a sizzle in a large skillet/saute’ pan. Add chicken and fry on medium-hi heat until slightly browned all over. About 5 minutes. Remove the chicken to a plate. Keep warm. Add the onions to the pan, stir for a 3-4 minutes. Add the garlic and saute, until onion has softened a little, another 1-2 minutes. Add the chilli flakes and coriander, stir for a few seconds to release the aromas. Add the tomatoes, chicken stock and wine. Season with salt an pepper. Bring to a simmer, cover the saucepan and cook for 45 minutes or so, occasionally stirring, until the sauce is reduced to a thick glossy sauce. I found it took about 1 hour and a half to reduce the sauce. Alternatively, add a little cornstarch or flour mixed with water and stir into the pot as necessary. Shred chicken and return to pan. Add the fresh herbs. Stir and cover for 10 minutes, so the flavors can infuse. Season again, if necessary. Serve over rice or potatoes and garnish with lemon slices.